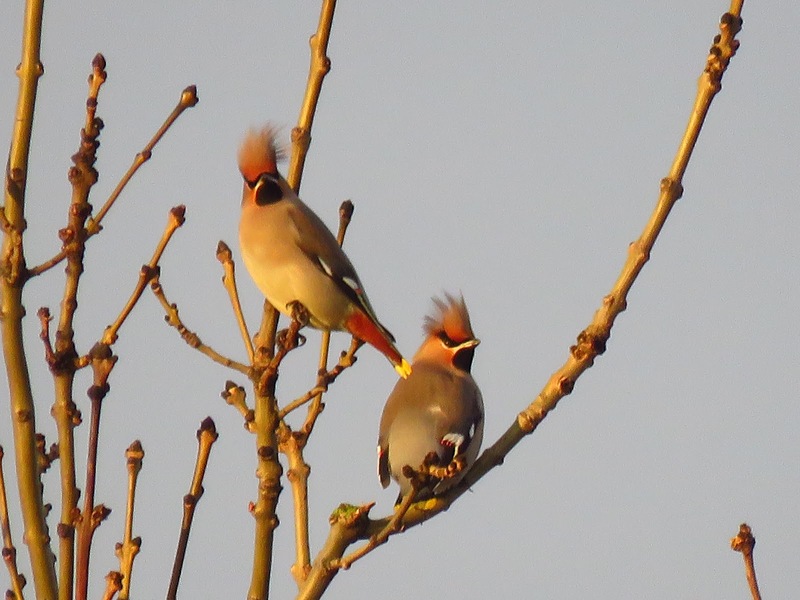 Yesterday, I got up early and had a short drive to a local supermarket to watch some Waxwings that had been reported. 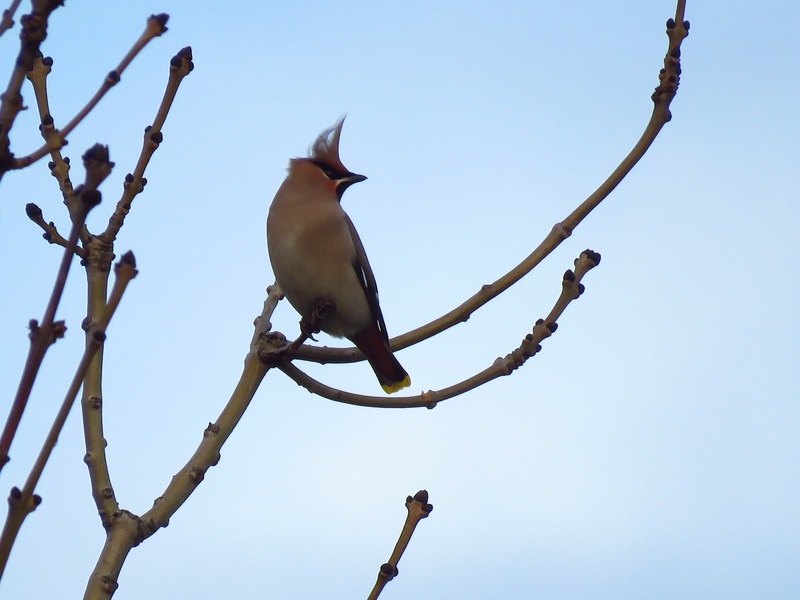 Waxwings are irregular winter visitors to the UK, especially to its eastern side, and are most likely to arrive to a supermarket car park near you. 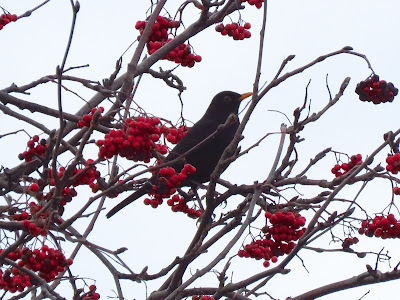 A lovely mild morning with sunny spells and a light wind, I walked around the quite empty car park checking the rowans, a couple of small ones still with berries. 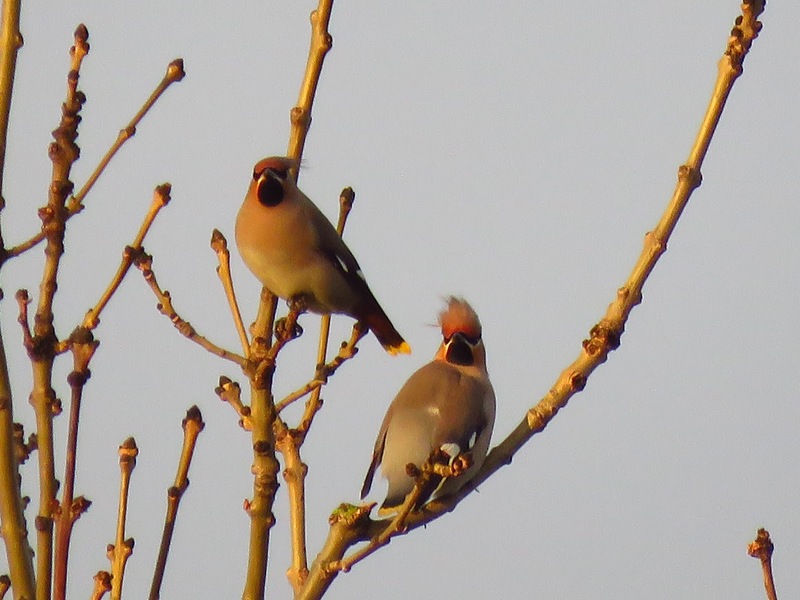 two Woodpigeons and a Blackbird were feeding on them, but no trace of Waxwings. Blackbird sitting on a rowan still laden with berries. 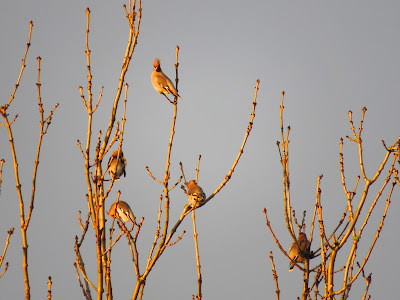 Suddenly, a flock of six Waxwings appeared silhouetted against the rising sun and landed on the tree in front of me. Almost every time I've seen Waxwings, they alternate between bouts of frantic berry feeding and resting in a tree nearby. It's not just any tree, it is a particular tree. This tree attracts them like a magnet and they appear not to settle anywhere else. This time their safe tree was an ash, the tallest tree in a row on a rise by the road separating two supermarket car parks. The Waxwings spent a few seconds feeding on a yellow-berry rowan, and then they flew back to the top part of the ash tree, where they spend most of the time. Other times the flock would fly towards a rowan and return to the safety of their tree even before landing. They are extremely watchful, looking up nervously every now and then with bouts of preening, resting and calling. 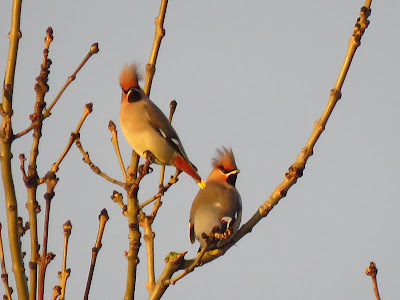 Their quiff-life crests rise or flatten with their mood (compare the top shots taken a few seconds apart), sometimes becoming ruffled with the breeze. They are not particularly wary of people, some photographers assembled just underneath their tree, pointing at them with their cameras, walking right under them, and they paid no attention. 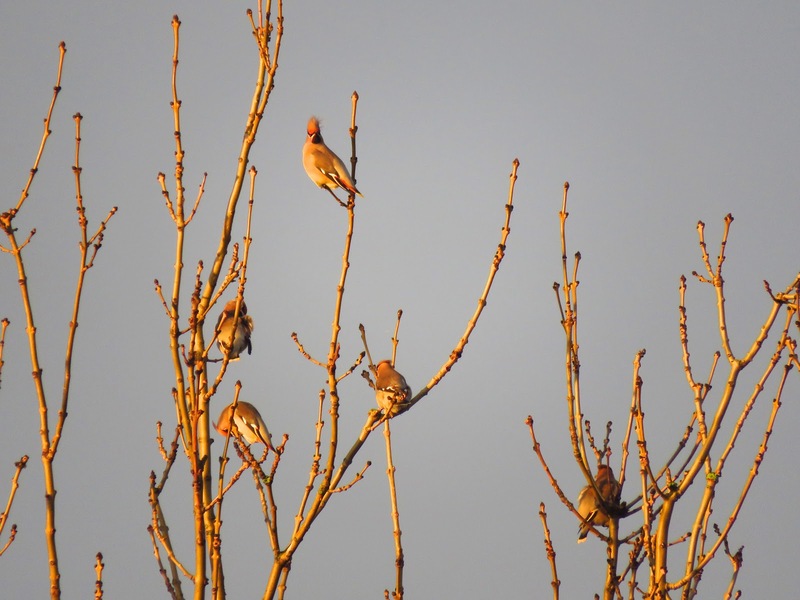 Birders and Waxwings on their safe tree. Instead, they are watchful of predators. Being small birds, similar to starling in size, they would be easy prey for Sparrowhawks. Indeed, later on, when I go for a wander in the area, I see a Sparrowhawk flying past chased by a flock of starlings. 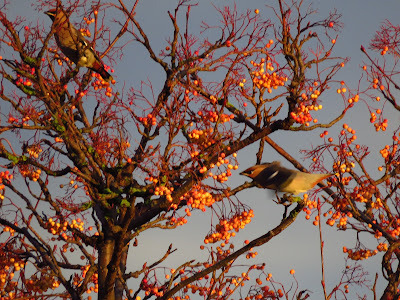 This is the only shot I got of the Waxwings in the rowan where they fed. When to go to feed? 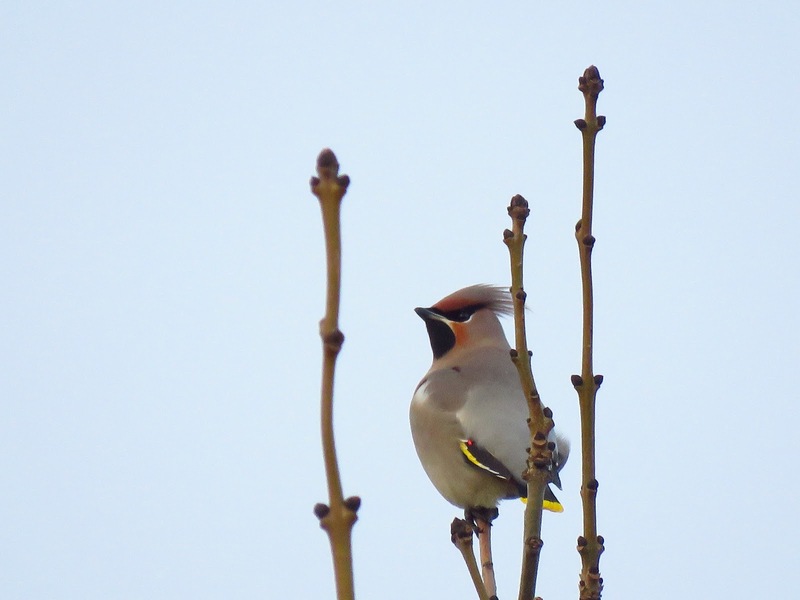 It was interesting to watch the individual Waxwings on the tree. 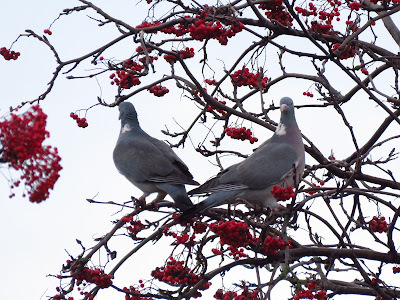 At some point one of them appeared restless, and would fly from branch to branch around the others - which were preening or resting - or it would fly up and away from the tree a short distance, and if the others didn't follow, it would return. This individual appeared to be rallying the group to go and feed. Earlier in the week there had been nine Waxwings about, then the six yesterday. Today just two remained. 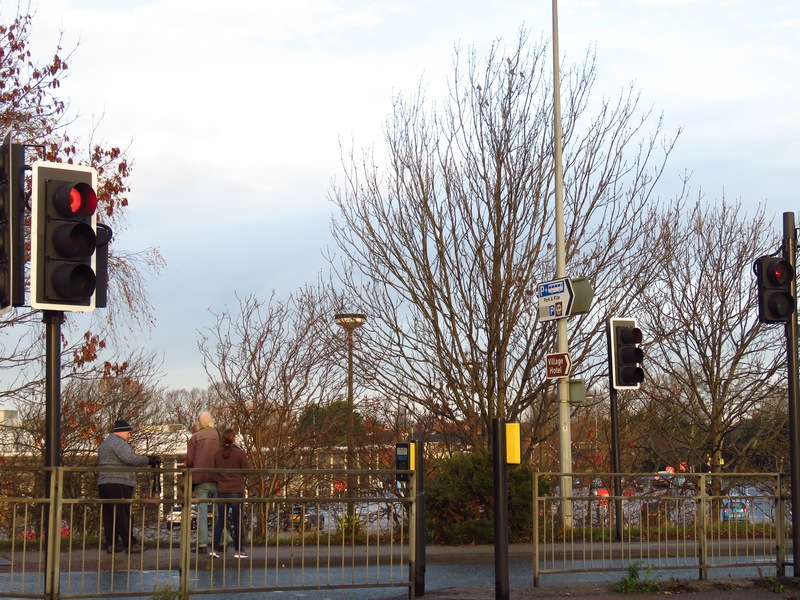 Two Mistle Thrushes sat on a lamppost, guarding the rowans, so not sure the Waxwings will stay much longer. The two waxwings sat close in the tree and billed each other briefly, maybe passing some food? Early arrival of Waxwings indicate an irruption year, so I do hope there's more opportunities this winter to catch up with them. Interesting as always, and lovely pictures. I hope the Waxwings make it down to London.